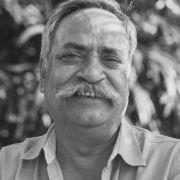 Piyush Pandey is the Executive Chairman and the Creative Director of Ogilvy & Mather India (the first creative head to occupy this post) and the winner of over 400 ad awards from all over the world. Pandey, under whom Oglivy & Mather has become the third largest advertising agency in India. Piyush Pandey's career at Ogilvy, from a trainee Account Executive to Executive Chairman is a story of excitement and achievement, accolades and applause. Born in Jaipur, Rajasthan, Piyush obtained his Master's degree from St Stephen's College, Delhi. Cricket seemed to be his calling as he led Delhi University to its win in the Rohinton Baria Trophy in 1979. He also played in Ranji Trophy, India's premier domestic cricket tourney. Piyush even worked as a tea taster, before joining Ogilvy in 1982 as a suit. In 1989, he moved to the creative department in O&M, became the Creative Director at Ogilvy, Mumbai in 1992 and rose to become the National Creative Director, O & M, India by 1994. The following year, Piyush was nominated to the Board of Directors. Under his leadership, O&M has succeeded in retaining its well-acknowledged leadership position in Indian advertising for 8 years in succession. In Feb 2004, he was appointed the Executive Chairman for Ogilvy, India & South Asia. Piyush redefined Indian advertising by curing its colonial hangover and reaching out to the 1 billion strong Indian masses, by speaking to them in their own language. Within the country, Piyush is acknowledged as an industry leader. In fact, The Economic Times, India's largest business newspaper declared him "the most influential man in Indian advertising". In 2000, the Ad Club of Mumbai voted his commercial for the adhesive brand "Fevikwik" the commercial of the century" and his work on "Cadbury's" as the campaign of the century. Piyush has won over 600 national and international awards to date. He was voted Asia's Creative person of the year at the Media Asia Awards 2002. He is the only Indian to have won a double Gold at Cannes and a triple Grand Prize at London International Awards. In 2003, O&M India won a record 10 Lions at Cannes, which was more than the collective metals won by rest of the Indian advertising fraternity. In 2002, he won India's first ever Silver Pencil at the One Show Awards. Piyush was also a member of the Clio Jury 2000 and Cannes Film Jury 2002. In June 2004, he was invited to be the President of the Jury for Outdoor & Press and Film at the Cannes International Advertising Festival, a first for an Asian, in 51 years of the Cannes Advertising Awards.